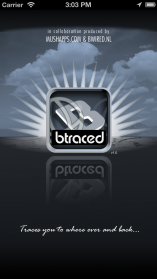 Btraced is a featured real time app that traces your Track and Trace, and allows you to upload your way to the server of your own choise. Track and Trace is possible to be uploaded online or offline with option to upload it later (with wifi). - See location, speed, direction, altitude, course and distance traveled. 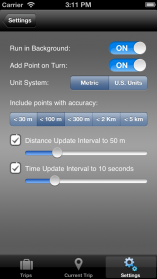 - Make a track of distance and time traveled. - You don't need Internet while you are doing the track (offline mode), you can upload it later. - You can manage all your trips with phone, you can upload any trip later. - You can see your trips or actual position on phone maps. - Export a file GPX and send it via mail. - Interface with own aplication, for example Fleet Management or Home Automation. - Sample server software, XML format and Btraced Protocol free available. - Abiity to run in the background. We are very grateful with those who have wrote to us! 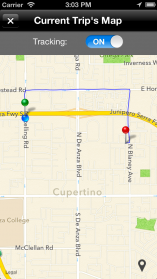 This is the most accurate iPhone tracking app ever. If you use your personal vehicle for business, you must get this app. It will give you turn-by-turn waypoints of your most recent trip or your entire day of travel. I have just one word for it: Fantastic. This is a great app with amazing support from the developer. This app can help one keep track of their kids and other family members. There are no monthly fees or any reoccurring charges. 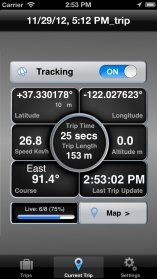 The gps data can be seen on your own server or the btrace website. This app can also be integrated into Homeseer home automation very nicely. Can have your Homeseer execute specified commands(events) when you arrive home or leave. GREAT APP, VERY RELIABLE, and GREAT SUPPORT!! In a word, great app. Very accurate and with home automation fantastic. Hoping they make some battery changes but the developers are very responsive. This is an amazingly accurate app, wish I had found it earlier. Extreemly accurate positioning and not too heavy on battrirs (depending on you settings). Great not to have to go through Google Latitude. Jammer ! App gekocht voor mijn iPhone 3G die ik voor het reizen gebruik (heb ook een iPhone 4). Werkt alleen vanaf iOS 4.3 en op de iPhone 3G werkt dit iOS niet meer. Dus deze App ook niet...... Kortom weggegooid geld. Graag een paar aanpassingen aan de APP zodat deze ook op de 3G werkt. Installing is easy , and works right Away with the btraced server, next step is implantation in my homeseer system. The forum is a good starting point for that. Thanks for this great app.